Mexican Cake - Red Wine Barrel-Aged (2013) | Westbrook Brewing Co.
Had to write a quick review as this is the closest thing to a 5 I have had, in fact it is a 5 in every way. Half finger tan head on a jet black body with nice lacing. Aroma of red wine, some peppery heat, dark chocolate and oak. Flavor of cocoa, vanilla, oak and wine with perfect degree of heat. This one is actually perfect. Complex, all elements are at perfect levels and there isn't anything else like it. Full body and light to moderate carbonation. My first 5. Appearance: Opaque black with a short lasting dark brown head. Overall: OMFG... there is no beer that I've ever had that can be compared to this. Very sweet, raspberry chocolate cream egg in a bottle. The Cab presents itself unlike any other wine barrel aged beers I've had... no mustiness, just a completely new flavor when combined with the chocolate. 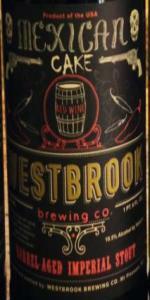 Mexican Cake - Red Wine Barrel-Aged (2013) from Westbrook Brewing Co.